Here’s a simple, solidly tasty Veggie Dip made from Greek yogurt and flavored with handy dried herbs and spices. Serve it to kids who love to dip! We want our kids to eat more fruits and vegetables, and kids want… what? Creamy, rich-tasting things. Salty things. Sweet things. Things that are fun to eat with their hands. Here’s a recipe that combines rich, creamy Greek yogurt with zesty dried herbs and spices to create a dip that’s just begging for someone to dunk a carrot stick into it. Try it with any of your favorite raw veggies and crunchy pita chips. Yes. Yes. Absolutely yes. The base of this recipe is nutritious yogurt, a whole food that comes with protein and probiotics to boot. We don’t live in the world anymore where a Veggie Dip is likely to be called “fattening” or other disparaging words. Thank goodness. Vegetables are very low in calories. Pairing them with a higher-calorie dip creates balance, which is good. Kids need fats, including saturated fat, for healthy brain growth. Just about anything that encourages us, and our kids, to enthusiastically gobble down veggies, is something to celebrate! So dip away. 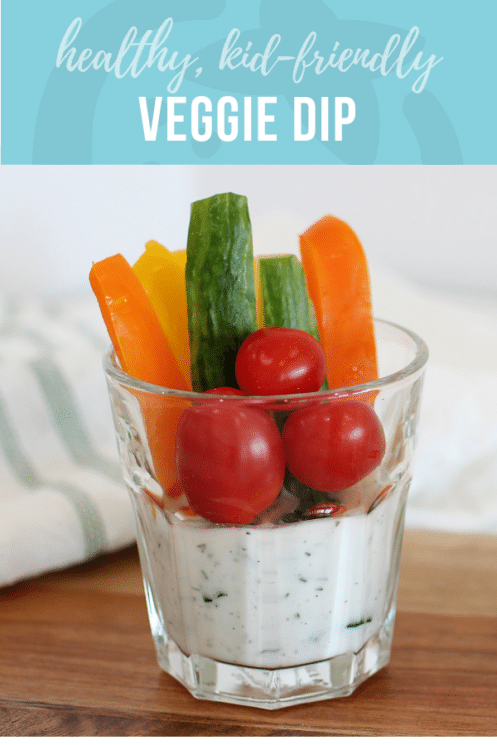 Enjoy those fresh crunchy veggies with a big dollop of dip! How Long Does Veggie Dip Last? This dip will last in the refrigerator for four days, but once you set it out on the table, do your best not to let it sit out for more than 3 hours. You can avoid waste by keeping the serving bowl in the fridge, and a smaller dip bowl on the veggie platter. Then refill as you need to. 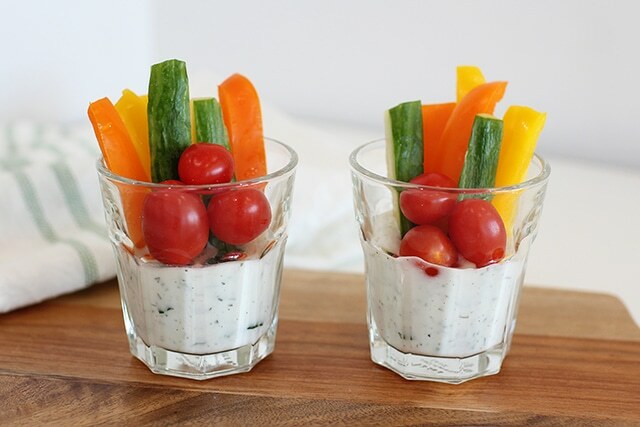 You can also dole out individual portions of dip in small cups with the veggies stuck right in. 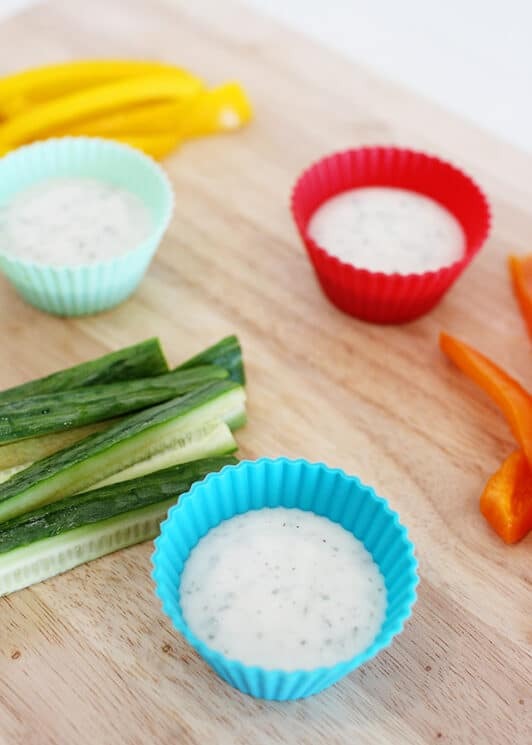 Then little ones can delight in having their very own personal veggie cups to snack on. Happy dipping! 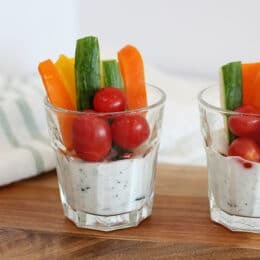 And because you can never really have too many dip options… try 10 Super Healthy Homemade Dips or these Kid-Friendly Veggie Dips. Place all ingredients except the milk into a large mixing bowl. Mix until smooth and blended together. To reach desired consistency, add 1-2 tablespoons of milk at a time, thoroughly mixing after each addition of milk. Slice peppers and cucumbers. 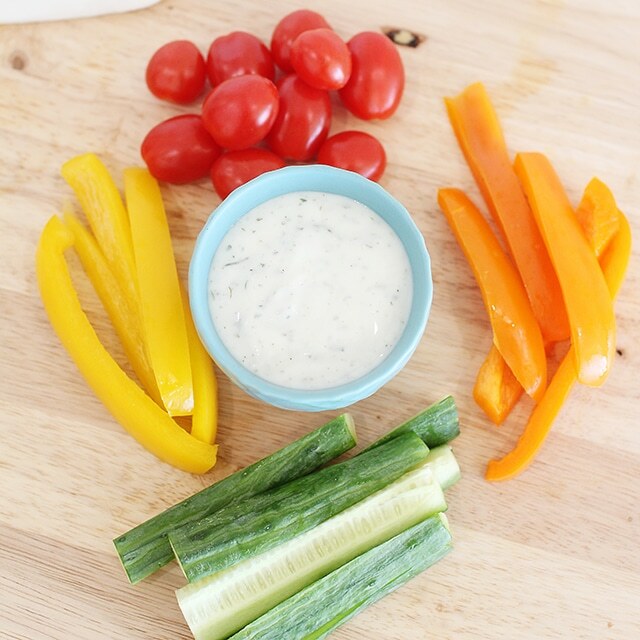 Serve veggies with dip. Great idea on the yogurt base for ranch! I always mix mine with sour cream and milk (hate mayo) but hello, Cholesterol City! I noticed recently that the Hidden Valley Ranch packet ingredients include MSG–what’s your opinion on MSG–good, bad, or indifferent? We go through a packet maybe every two weeks or so. We really like hummus and the knorr vegetable dip with chopped spinach (www.liptonfavorites.com) My kids that eat veggies without coercing will eat both of these well. I use fat free sour cream, haven’t tried the yogurt yet. SAHMmy, I am indifferent to MSG. I know studies may have shown it to cause nerve damage to cells, however I believe you need to be consuming unlikely large amounts. I am not religious about avoiding it. Lisa, I’m surprised your kids eat hummus. I’ve been too nervous to try it myself. I guess I better get some so I can have something to blog about. Hey, I found your blog through Beth’s and I’m cracking up at every entry. Love it. I’m hoping that you’ll keep supplying me with ideas for getting Dan eating his veggies. He’s the picky one. Maggie is only 15 months and she just shared a salad with me. Its all I can do to get Dan to eat CORN! Oh yes try Hummus. Its so good. We love it on whole wheat pitas. Its also delish with celery. Megan, I’m so glad you came to visit! (my blog that is). I’ve been reading your blog for ages, it’s fabulous. Take care of that little Maggie for me, more salads. Dan too, we don’t need our men to croak early on us.